A spring roll is a traditional Chinese snack, made with a round, thin dough sheet with fillings rolled inside and deep fried in oil. 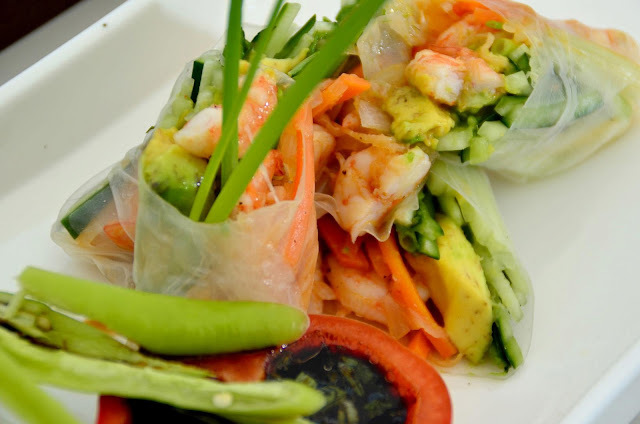 Spring Rolls are especially popular during the Chinese New Year, also called the Spring Festival, hence the name now most commonly used. 1. Sauté the shrimp split in half in vegetable oil and sesame oil. 2. Dip the rice wrappers in hot water until soft then place them on a wet rag and arrange on top the julienne of vegetables and the sautéed shrimps. 3. Roll and reserve until service time. Then deep fry until golden brown.